I chose a dark colored bottle with a sprayer on it. I put the distilled water and the alchohol in the bottle first. 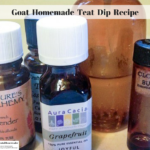 Then I added the essential oils, one at a time, starting with the grapefuit essential oil and working my way down to the clove bud essential oil. Once all of the ingredients were in the bottle, I put the sprayer nozzle on, tightened it down and shook it. To use it, shake well, spray each teat several times to make sure the openings are coated. That’s all there is to it. Note: Keep the homemade teat spray in a cool, dark, dry place.